One of the joys of these long hard winter months has been listening to Wickerbird’s The Crow Mother. Glorious in mystery and magic repeated playings, as snow blanketed my lovely garden or taking coffee with Sue and our feline companion Roxanne as the winter sun illuminated our conservatory, The Crow Mother has been a joy. Cold night walks under a myriad of stars with the headphones on reveals The Crow Mother’s undeniable beauty. With a gentle hint of Spring in the air, Blake Cowan gives his own glimpse of warmer days with the promise of Wickerbird’s new record, The Westering. ‘The Hollow’ is the first track released as a taster! Continuing where The Crow Mother left off; a bubbling stream leads the listener on a journey accompanied by familiar companions. Ethereal acoustic guitar, all reverb and echo, and breathy vocals full of space and air. There is nothing sad about Blake Cowan’s music. You are led into and engulfed in a warm blanket of contemplation and peace. In this crazy world it’s somewhere we all need to go to. I am awaiting the full works with the same joy and anticipation that the landscape I love waits for Spring. And although we wait for Spring, The Westering arrives. There is a hidden garden in the centre of St. Ives, Cornwall. Sculptress Barbara Hepworth lived and worked here. The garden, now open to the public, is a very special place. I am sat in the slightly run down greenhouse in an old 1950’s chair among weary cacti and succulents looking out onto bronze sculptures as they glisten from rain brought in on a westerly wind, I am contemplating beauty and eternity. Silent, except for a seagull’s mew, all is silent. 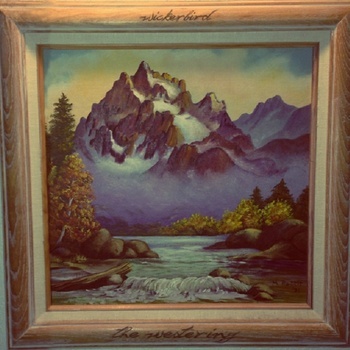 Also perfect, I muse to myself, is Wickerbird’s aptly titled EP The Westering. The Westering finds Blake Cowan, with his rucksack freshly packed, guitar and notebook to hand, tuning into natures enduring song. Deeper into the mysteries he wanders without a map as life’s journey leads him on. The Westering is elegant, the perfect extension to The Crow Mother. ‘Boreal’s atmospheric beauty leaves the listener spellbound while there is just a hint of quiet intensity in tunes such as ‘Harbour’ but don’t worry the trees are keeping us all company on this elemental journey. Like Thoreau Cowan invites us into his wanderings and to follow down the path of internal investigation and external bliss via Nature’s revelation. Sometimes I feel as though some of the more Bohemian Elves of Middle Earth have visited Wickerbird as he slept under the stars. This is music that touches the senses . Wickerbird Bandcamp. Facebook. Soundcloud. Tumblr. Twitter. Posted in Acoustic, Dreamy, reviewsTagged art folk, the Westering, WickerbirdBookmark the permalink.